Some of these celebrities include Beyonce, Kim Kardashian, Miley Cyrus, Madonna, and Katy Perry. Many people choose to wear single grillz because it is a simpler look, and it also does not feel like it is on because of the comfort. Here at 14kgoldteeth, we want to offer everyone the chance to have their own set of gold teeth. Our company offers 1pc and 2pc yellow gold grillz. Our most best selling design is the classic solid gold design. We offer our 1pc and 2pc products in three different karats of yellow gold. The more gold we use in each product, the higher the number the karats will be. We offer our customers the choice of 10k, 14k, and 18k in yellow gold for 1pc and 2pc products. 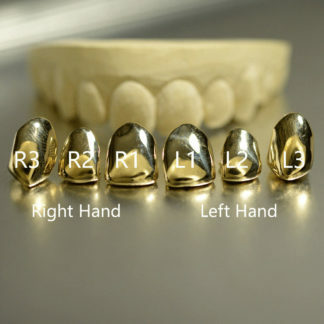 Since we are a custom gold teeth company, we do provide other number of pieces besides our 1pc and 2pc products. Any other number of pieces can be created with a custom order. Although our best-selling design is the solid gold design, we also offer other designs that customers can create for their teeth. We also offer open face, diamond cuts, diamond dusts, and iced out designs for our 1pc and 2pc products. Our 1pc and 2pc teeth can also be connected with a bar, either in the front of back. The placement of the front bar is mainly for appearance, while the placement of the back bar is mainly for security, as the bar will protect the single teeth from falling out. The front bar can be custom designed to incorporate a design of your choice. Some of our popular bar designs include hatching, cross-hatching, and classic solid. Customers can also create their own design through a custom order. Our 1pc and 2pc products are very exclusive. To create these small number of pieces, our designers use more gold and because they use more gold, these products provide a permanent look. Our customers can designate which position they would want their 1pc or 2pc product to be placed in. We can create these products in L1, L2, L3, R1, R2, and R3. We can also create L4, L5, R4, and R5 but for these placements, customers need to place a custom order. We can also create fangs and other designs on the 1pc and 2pc as well, but these options also require a custom order. Customers can create a custom order by calling or emailing our customer service. Can I get grillz just on my fangs? 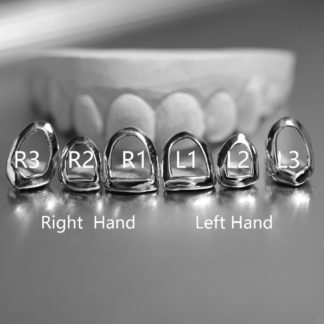 Customers can choose any teeth that they want to have their grillz placed. Since we are a custom gold grillz company, customers can custom design their own products to have the design and look that they love. Customers can get grillz just on their fangs if that is what they would like. Customers have the option of having the product on one fang, two fangs, three fangs, or all four fangs. Each fang would be a single tooth order on separate teeth placements. There is also an option of having extended fangs that provide the vampire fang look that extends farther downward, like a vampire. There are some people who enjoy this look, and if you like this look, then the extended fang option is for you! Customers can also create designs on the fangs, like the iced out, diamond dust, and diamond cut design, or keep the fang classic solid. All of the fangs are like regular teeth. The only difference is the placement of the tooth. 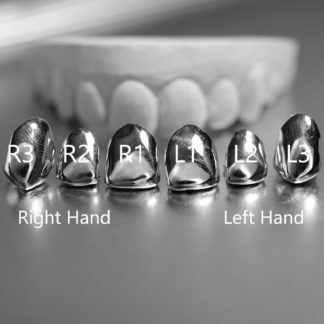 For customers who want only fangs, our fangs come in the same metal options as all of our other products. We offer fangs in yellow gold, white gold, and silver. Our yellow gold fangs consist of 10k, 14k, and 18k, while our white gold fangs consist of 10k and 14k. All of our silver products are 925 sterling silver. We also offer our fangs in rose gold, which would need to be placed as a custom order with our customer service team. Can I get grillz with a chipped tooth? Teeth come in all different shapes and sizes. Some people might be missing a few teeth, while others might have had accidents to have broken teeth or chipped teeth. Whatever the reason may be, our company works with people who have chipped teeth or broken teeth. Since we are a custom gold teeth company, we can make products take the shape of the chipped tooth, if that is what the customer wants, or we can design the tooth so that the chipped tooth looks like a full size tooth. The process for a chipped tooth is the same as any other type of product at no additional charge. After customers place their order, they will receive a molding kit to create an impression of their teeth. Once we receive the finished impressions, our designers will create the impression of the chipped tooth to look like a full size tooth or leave it as the chipped tooth, at the customer’s discretion. We can also add designs on the newly shaped tooth as well, including diamond cuts and diamond dust designs. For customers who have chipped teeth but have always wanted to wear gold teeth, you can finally wear one today at 14kgoldteeth. For those who are afraid to wear grillz with chipped teeth, we can help you design the gold teeth of your dreams so that you can confidently wear it and flash that million dollar smile to the world.